What it’s about: America is a good country for people, but not such a great place for gods. As immigrants came to the new land, they brought with them their beliefs–in sprites and pixies, trolls and succubi, goblins and gods. Now these supernatural beings are largely forgotten and unworshiped. Without the power of their flocks, they’re forced to eke out meager existences, conning and scrounging praise and sustenance where they can. A new crop of gods has risen in American soil though, the gods of technology. Worshiped by the masses, they want to drive out the old gods and claim this land as their own. A war is about to begin, fought on the back roads and in hidden sacred spaces of America. Unwittingly in the center of this conflict is Shadow, an ex-con whose been released from prison only to find his old life gone missing. With no remaining family, job, or place to call home, he agrees to become an errand boy for a mysterious stranger called Wednesday. A quiet, stoic man, Shadow takes the surprising events of the next few months in stride, even as he learns that his employer is centuries old and trying to rally very real deities in tenements and trailer parks across America to the cause of the old gods. Confronted with nameless operatives from the other side, restless waking dreams, and even the undead, Shadow continues to follow Wednesday’s lead not because of any conviction or drive, but more as a river follows its course–inevitably but unconsciously. 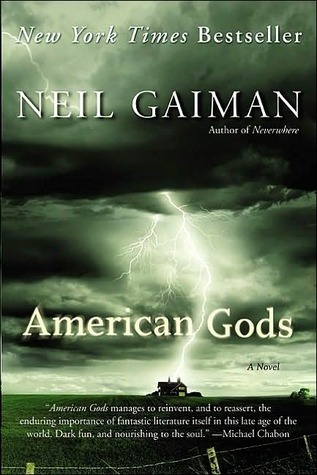 Religion in America: At the center of Gaiman’s novel is one repeated mantra: America is not a good country for gods. Gaiman’s argument stems from the idea that, although we are largely an immigrant country, those who traveled here did not continue to worship their own gods. In many cases, aspects of ancient traditions were integrated into new rituals, but the original significance was lost. An example of this is found in one of Gaiman’s “Coming to America” interludes, when the African slave Sukey attempts to pass on her rituals to a younger apprentice. The acolyte shows no interest in the “why,” concentrating only on the “what,” the means to her end. As a result, the tunes to sacred songs are passed on while the words are lost, the power diluted and the true meaning absorbed. Is Gaiman’s novel a critique of religion though? In my opinion, no. He purposefully avoids almost any mention of the gods that are still widely worshiped in America, from Christian, Jewish, and Muslim traditions. He focuses on bringing to life a forgotten selection of gods and envisioning what place they might find in modern society, how they might have adapted to survive. Would a death deity run a local funeral parlor? A love goddess turn to prostitution? How would each find the cosmic energy they need to survive? His portrait of America is also almost loving at times, especially in his detailed descriptions of the back roads and country outposts. American Gods could be described as a epic road trip, which is actually Gaiman’s tribute to what he views as the “true” American god: the land. Would I recommend? Yes, to mythology buffs and Americana enthusiasts. Gaiman’s portrait of America isn’t negative or positive, but rather respectful and earnest. And seeing ancient gods brought low and fighting for survival gives this adventure story an epic scope. Though Shadow is a reserved main character who some might struggle to relate to, I saw him as a vessel discovering his purpose and slowly coming in to his own. American Gods is my favorite Gaiman. Everytime I read it I get more out of it!